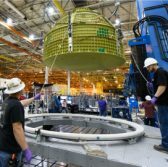 Lockheed Martin has built and shipped a capsule structure for the Orion Exploration Mission-2 spacecraft to NASA‘s Kennedy Space Center in Florida for final assembly. The company said Tuesday Orion’s pressure vessel is made-up of machined aluminum alloy parts designed to help protect the crew module from harsh conditions in deep space. NASA aims to place astronauts aboard the EM-2 spacecraft to the moon. Mike Hawes, vice president and program manager for Orion at Lockheed, said the delivery of the spacecraft’s capsule structure to Florida comes as the final assembly for the crew module nears completion. Hawes added the company is applying learned lessons from previous pressure vessel construction efforts to build the EM-2 spacecraft.